Today I have 2 rustic but clean and simple cards to share with you. Both of these cards could be created in about 10-15 minutes each. If you were mass producing, it would probably be less. 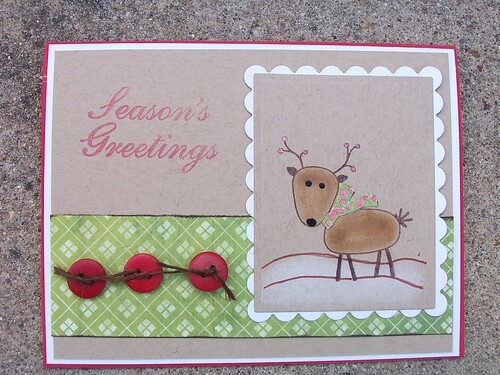 Both cards feature stamps by Hero Arts and kraft card stock. I love the look of kraft card stock. It goes with pretty much every color and it has a softer look than white and a more rustic look than cream. I use kraft card stock from Papertrey Ink. I love the weight of their card stock. I also pulled out some long neglected chalks. I have both the plain chalks and the shimmer chalks. I used the white of the plain chalks to get a good base of "snow" and then added some shimmer on top for more dimension. The shimmer is hard to see in the pictures but it pops in real life. For this first card I cut rectangles with my Nestabilities for the owl and the scalloped mat behind the owl. I started by stamping the owl in Chocolate Chip ink and then I colored over the brown with an orange stardust pen for his feet. I used the same pen for his beak. The eyes are shiny courtesy of a clear glaze pen. The scarf is finished with a green sharpie and a red stardust pen. 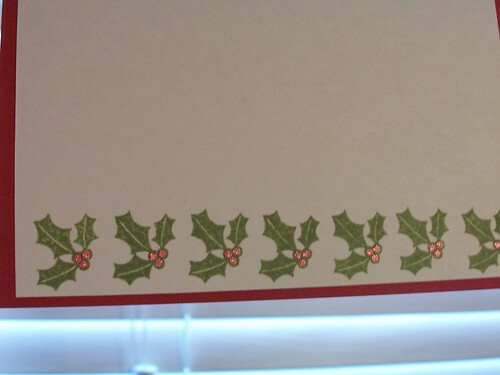 The strip of holly leaves was created by making score lines 1 1/2 inches apart along the lower part of the card and then I stamped the leaves randomly between the lines. The holly berries are filled in with the red stardust pen again. I always like to finish the inside of my cards. When possible, I repeat and element from the front of the card. 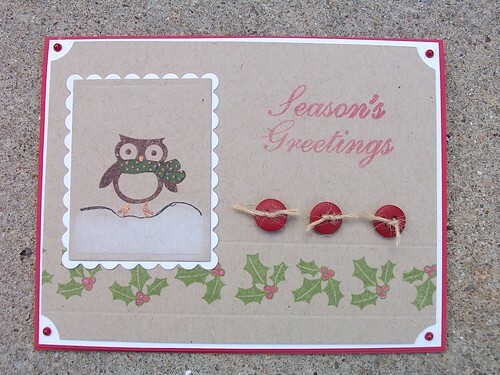 For the owl card I used the holly leaves again. My second card is finished similarly to the first card. For this card, I used a strip of patterned paper by scenic route instead of stamping my own design. When mass producing cards, this saves a lot of time. To add a little dimension, I inked the two edges of the paper. I put my stardust and glaze pens to work again on the reindeer.